YONG TAI BHD has been in a rut for many years. However, the Batu Pahat-based company, which is primarily involved in garment manufacturing, is beginning to see light at the end of the tunnel. Its textile manufacturing business has been loss-making for years. Yong Tai (fundamental: 0.0; valuation: 0.3) executive director Ng Jet Heong calls it a sunset industry and does not think it is a viable business anymore. Interestingly, Batu Pahat is famous for its garment factories but stiff competition and the reluctance of financial institutions to provide loans have caused many manufacturers to either close their doors or scale down operations. “If you can’t borrow, you can’t expand [your business]. It’s a choice between borrowing from banks and going back to shareholders for funds. But shareholders are reluctant to commit because there are no returns. That’s why we are at a critical stage. So what should we do? The only logical solution is to diversify,” says Ng. Yong Tai ventured into property development last year. It has started to see the fruits of its labour come to fruition in its maiden development in Melaka — a joint venture (JV) with PTS Properties Sdn Bhd to construct a 29-storey condominium hotel, dubbed 99residence. The project, with a gross development value of RM129.1 million, is fully sold and on track for its opening in June. It is noteworthy that the construction works were done by PTS Properties while Yong Tai was the project manager. The JV arrangement is expected to add RM8 million to Yong Tai’s bottom line. For the cumulative six months ended Dec 31, 2014, the company registered a net profit of RM745,000 — compared with a net loss of RM1.25 million in the previous corresponding period — due to a profit of RM1.45 million from its property development division. By the end of its financial year ending June 30, 2015 (FY2015), all RM8 million in profit is expected to be recognised in its books. “99residence gave us a good kickstart. A profit of RM1 million is not fantastic but it is a huge turnaround for us. We are improving quarter by quarter,” says Ng. Nevertheless, Yong Tai does not want to be known as just another property developer. Ng says the company intends to focus on tourism-related properties. “I’m very particular. Every project I choose is related to hotels. My reason is simple — you don’t just sell the properties; you can still manage them and have a recurring income,” he explains. The company recently inked another JV project with PTS Properties to develop a hotel and serviced apartment, known as The Apple, in Melaka. The hotel will be operated by Courtyard by the Marriott group, which has signed a 20-year contract. Through the JV, Yong Tai will have a share of the profit from the sale of the serviced apartments as well as from the operation of the hotel. In turn, Marriott will be paid to manage the hotel. Yong Tai expects to reap a profit of RM50 million over the next three years from the project, which is set for completion in 2017. Nevertheless, the last two quarters of FY2015 will continue to be challenging for the company as more contribution will only be seen in FY2016, says Ng. 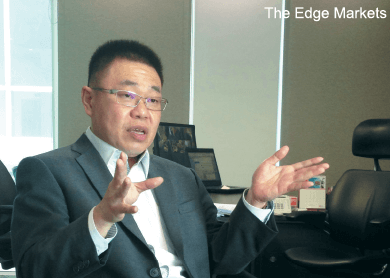 Melaka was the top choice for Yong Tai and PTS Properties because of a lack of international hotel chains in the state, PTS Properties director Boo Kuang Loon tells The Edge. Boo says the occupancy rate of hotels there average 78% yearly. This includes the international hotel chains, boutique hotels and budget hotels. Even before the ink is dry on the recent JV agreement, Ng is already on the lookout for more. The company is in talks with several parties for projects in Melaka and Kuala Lumpur, which are its locations of choice for now. He reveals that Yong Tai is eyeing Jalan U-Thant in Kuala Lumpur and Puchong, Selangor, for its next project — likely to be a serviced apartment and hotel project. The company is also on the lookout for land, but its first priority is to sustain its turnaround and build profits before making any acquisitions, he adds. That said, Yong Tai has a pressing problem — only 40% of its garment business, which includes 15 retail outlets selling clothing under homegrown brands such as Effu and Emilio Valentino, is profitable. “My manufacturing concern is giving me a lot of headache. We are struggling with the bottom line. There is no point making good profits from property development and then suffer losses at the manufacturing arm. It puts me back to square one,” says Ng. Yong Tai is looking to scale down its garment operation but it knows that merely closing down its outlets is not a long-term solution. As at Dec 31, 2014, the company had borrowings of RM19.12 million — six times more than its cash. This translates into a net gearing of 0.97 times. Note that as at Dec 31, 2014, Yong Tai had amount due to directors totalling RM16 million. The company also has accumulated losses of RM25.25 million. Nonetheless, Yong Tai recently proposed a rights issue with warrants and a private placement to raise RM63.32 million, of which RM5 million will be used to pare down its borrowings. The rest will be used in its The Apple development in Melaka and future property projects. Over the past year, the stock has traded between 58 sen and RM1.33. Its peak of RM1.33 came a day before its first foray into property development was announced on April 29 last year. Yong Tai’s single largest shareholder is the Liew family’s vehicle, Liew Fat Lin Holding Sdn Bhd, which has a 20.69% stake.